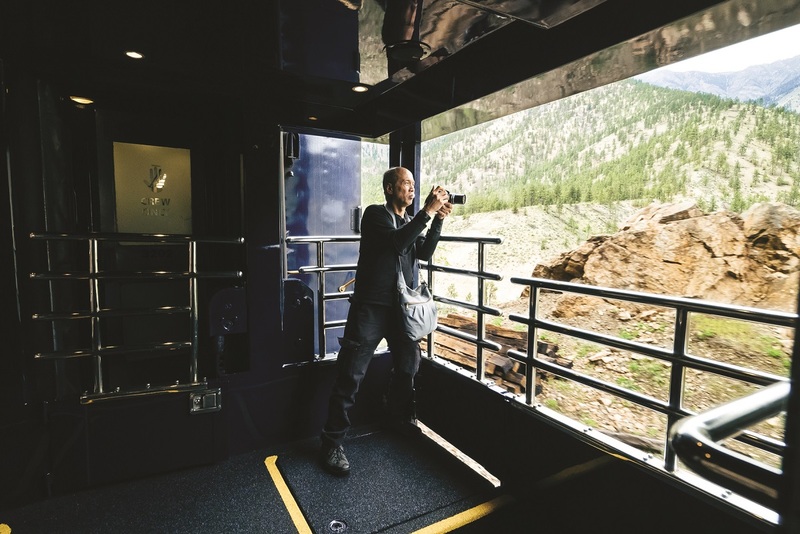 Threading its way between snowy peaks and raging rivers, Canada’s Rocky Mountaineer oﬀers a grandstand view of Nature at her most spectacular. B ear to the left! No, not the cry of the satnav but a carriage full of camera-toting sightseers. And there she was – a huge grizzly, just yards from our top-deck vantage point. Could she hear our whoops and cheers? I doubt it – but as our train rumbled slowly past, this magnificent Queen of the Rockies reared her head and glared in our direction, before sauntering off to forage for food. We had been promised the trip of a lifetime, and Canada’s famous Rocky Mountaineer railroad did not disappoint. Taking our seats on the top deck of a GoldLeaf observation car, we saw that the railyard staff had all turned out to wave us off. It was a nice touch – but we soon learned that Rocky Mountaineer thinks of everything. Our first day would take us from Vancouver to the small town of Kamloops, along the First Passage To The West Trail. Following the Fraser River, our route skirted the mountains as we chugged through small communities such as Hope (“The Chainsaw Carving Capital of Canada”) and Yate (“The Wickedest Settlement in British Columbia”). But while the place names were worth a chuckle, the scenery left us open-mouthed as we traversed the dramatic canyons of the Fraser Valley. At Hell’s Gate we slowed to a crawl to witness crashing waters forcing their way through the narrow passage. The Jaws of Death Gorge was frightening in its splendour. Yet almost equal to these marvels of nature were the very tracks we travelled on. You cannot make this journey without marvelling at the achievement of those Victorian pioneers who forged a rail route through this wilderness. Thanks to them, we could enjoy our journey in the lap of luxury. With wide, reclining seats and generous legroom, our GoldLeaf carriage could hardly have been more comfortable (there is even a lift between decks for those who find the narrow stairs hard to manage). The panoramic roof enabled 180-degree observation of our glorious surroundings, while if we wished to stretch our legs and take in the fresh air, we were free to use the open-sided observation vestibule at the rear of the carriage. In every car there are no fewer than three on-board hosts, whose job it is to explain, inform and ensure that passengers see all the sights, as well as serving drinks and snacks. The food is superb and all included in the fare – including at-seat drinks, morning scones and afternoon wine and cheese. Main meals in GoldLeaf are taken in the lower-deck dining car, but large windows ensure there is no danger of missing spectacular sights and wildlife encounters (we soon learned to eat with the camera to hand). 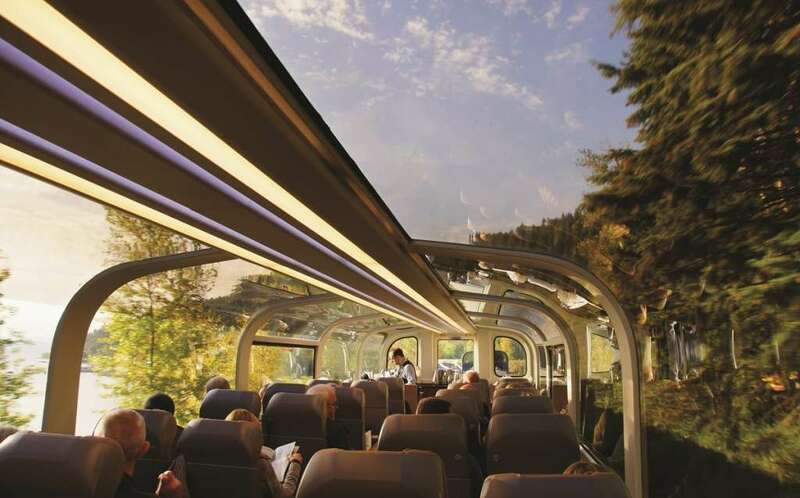 Those passengers choosing SilverLeaf travel in a single-deck carriage but still enjoy dramatic views from panoramic windows, and meals are served at-seat, which some passengers may prefer. The shores of Lake Kamloops heralded the end of our first day’s journey, and we were greeted by a mounted welcoming party – a sign of the importance of the railway to this tidy town, with its vibrant bars and restaurants. Here was our bed for the night, courtesy of Rocky Mountaineer, and we arrived at the hotel to find our luggage awaiting us in our rooms. The following day was another early start, made up for by a glorious breakfast as our train headed west. Hoodoo-spotting along the way (these are giant rock formations, carved by the elements), we ticked off the Adams and Eagle rivers, heard the tale of Billy Miner, Canada’s most incompetent train robber, and slowed to a snail’s pace as we passed through Craigellachie where the last spike was ceremonially driven into the track in 1885, marking the completion of the Canadian Pacific Railway from coast to coast. As the day progressed we trundled through the five-mile Connaught Tunnel, crossed the breathtaking Stoney Creek Bridge, and after hugging the Kicking Horse River we entered the amazing Spiral Tunnels, where the train doubles back on itself inside the mountain. All too soon were arrived at Lake Louise, Alberta, our journey’s end. Here we said our farewells to our hosts and a coach whisked us to the glorious Fairmont Chateau Lake Louise hotel, beside the still-frozen lake itself. Rocky Mountaineer had organised every element of our trip, right from our hotel pick-up at Vancouver, and everything about it was simply wonderful. Over two days we had notched up sightings of three brown bears, one grizzly and several elk, as well as eagles and ospreys too numerous to count. We had traversed gorges so deep that it defi ed understanding how they’d ever been bridged. We had witnessed raging rivers, marvelled at stunning waterfalls and gazed in wonder at snow-capped mountain peaks that stretched as far as the eye could see. This was not just a must-do for anyone considering a cruise from the Canadian or US Northwest. It was one of life’s great adventures. Vancouver to Lake Louise, two days including overnight hotel stay, from £1,280pp in GoldLeaf class. 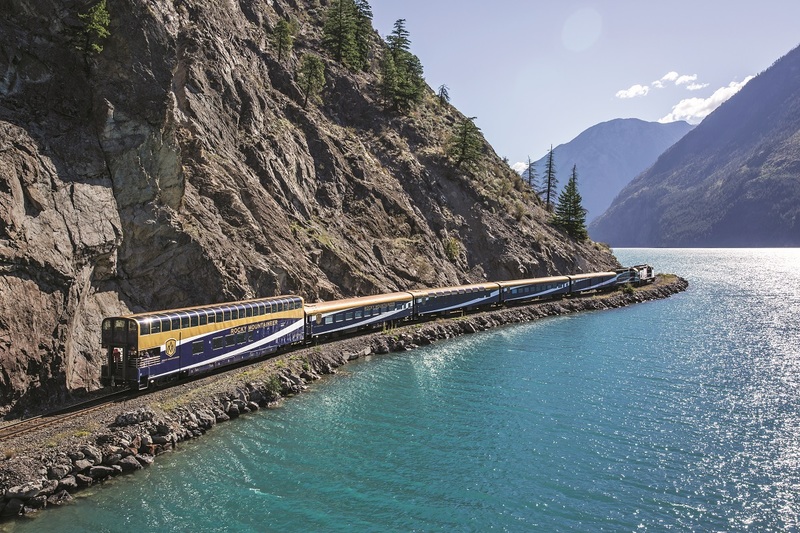 Rocky Mountaineer offers itineraries between Seattle, Vancouver, Banff, Lake Louise and Jasper (call 02392 808 720 or visit www.planetcruise co.uk). Trips are offered as cruise add-ons by Celebrity, Silversea, Princess, Regent and Noble Caledonia.